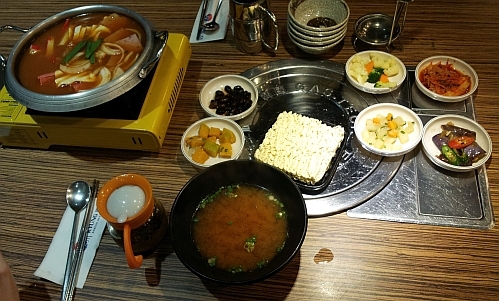 Budae Jigae (to share) - MYR55.80+ (10% service charge to be MYR61.40 nett). Budae means Army Unit or Military Unit so this is a Army Stew that has US style processed food such as sausages, spam (luncheon meat), slices of cheese, instant noodles and etc. 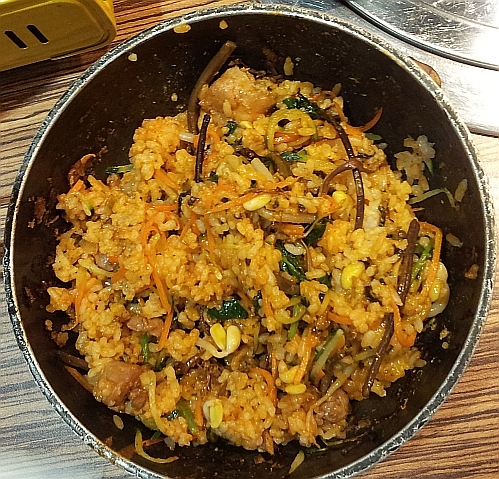 A very flavourful jigae. The Banchan (side dishes) are very different from the ones served here except for the kimchi which is a must-have side dish. 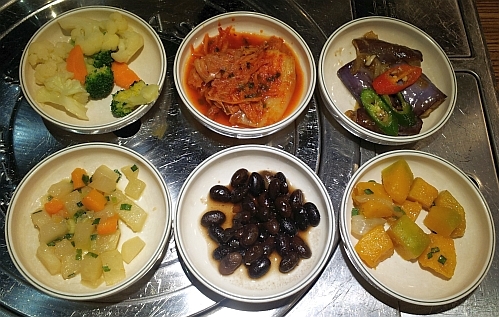 There are six refillable side dishes - 1. broccoli, cauliflower and carrots 2. kimchi 3. brinjal and chili 4. pumpkin 5. black beans 6. radish cubes. All side dishes are tasty. 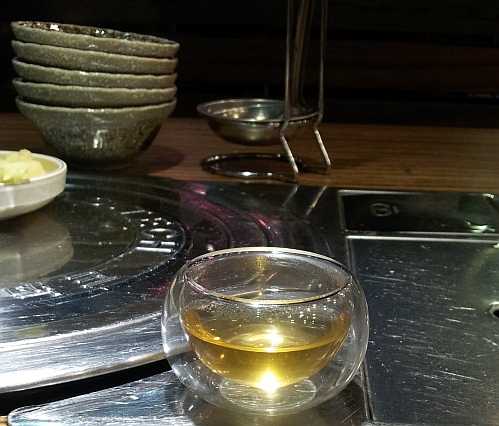 We ordered two bibimbap (chicken meat) sets (with a glass of green tea or barley tea) to share. 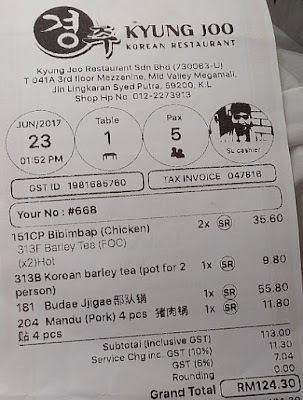 MYR17.80+ (MYR19.60 nett). After mixing everything up. My friend would prefer it to be more flavourful but the taste is ok for me. 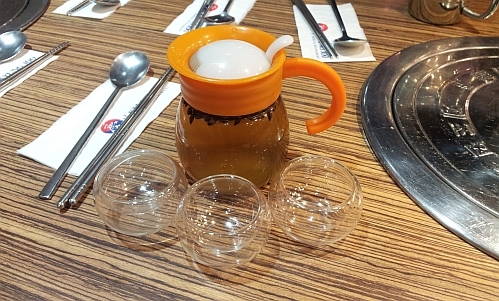 4 Mandu (in Korean, gyoza in Japanese) to share as well. Costs MYR11.80+ (MYR13 nett). The dumplings are plump with lots of fillings. A pot of hot barley tea at MYR9.80+ (MYR10.80 nett) meant to be shared by 2 pax but there were 5 of us with 2 glasses of hot green tea from the 2 bibimbap sets so the waitress was smart enough to bring us 3 small glasses without us having to ask for it. It has a double layer of glass with air in between for insulation so that your hand can hold the glass and will not feel the heat from the hot tea. 5 pretty swirl bowls for us since we are sharing all the food. MYR124.30 nett for 5 pax so it means that it is MYR24.85 nett per pax. Reasonable price considering how full we were after this meal. 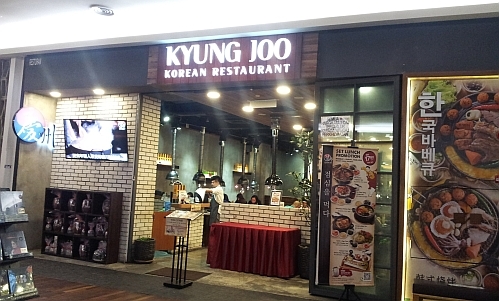 This Kyung Joo Korean Restaurant is located on the highest floor in Midvalley Mall, near the cinemas. It is next to Taiwan Recipe. oh so you like the dumpling more. good to share share to eat. Not a fan of Korean, will go and eat when the ladies in the house feel like it. Majority wins. we also go by the majority here. This post makes me hungry. 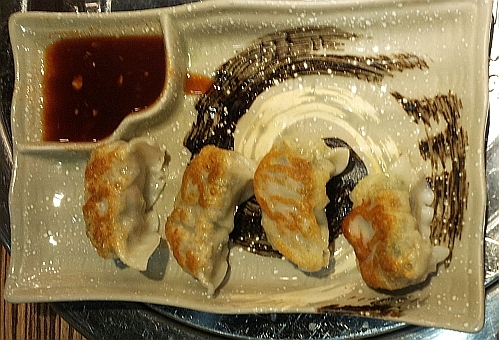 the dumpling should be familiar to you as it is similar to the local dumplings. 5pm you can go for early dinner break. Not bad for such portion. single portion is too big for me. I have heard of this Army Stew but never tried. if you have kimchi can cook at home since mostly using processed food like sausages and luncheon meat. The only familiar thing and which I like is the Mandu. 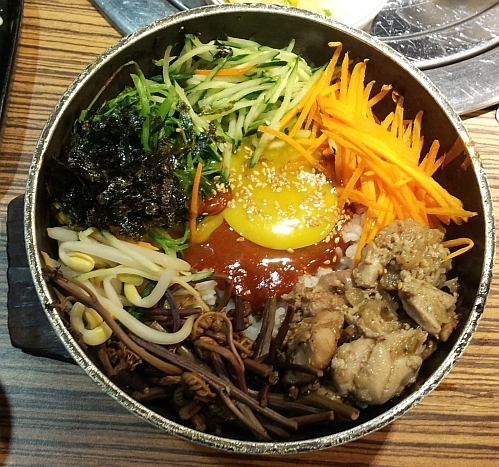 I am not really a fan of Korean food but I don't mind if with friends. The Army jigae is interesting! Full of unhealthy stuff so much be very tasty. hahaha you are so honest! :) yes those processed food are deemed as unhealthy. 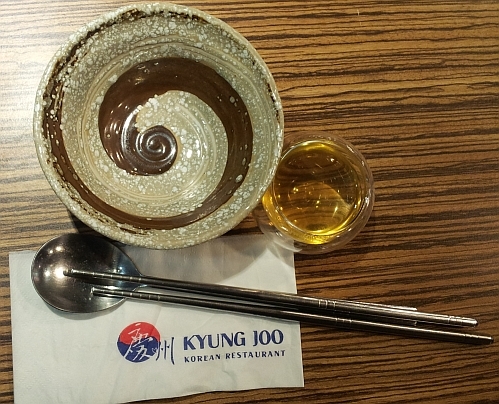 Korean food is most welcome anytime. I have heard of their Army Stew many times in their TV dramas. I have not tried them. you are on the road to eating healthy and I don't think this processed sausages and luncheon meat army stew can be considered healthy food. lol!